Over time we change the words we use to refer to things – in education just as elsewhere. One way to see how vocabulary shifts, is Google’s Ngram Viewer. Ngram Viewer shows the percentage share a particular word or phrase gets of all words or phrases published in a particular year in books that are part of Google’s corpus or library of scanned books, 1500-2008. Looking over a number of years, you can get a sense of that word’s relative performance – whether it becomes more or less popular (in written, published, Google-scanned texts that is). ‘Education’ and ‘learning’ are very different kinds of words but it’s interesting how their frequencies changes relative to each other, as equals in 1800 before ‘education’ becomes much more (indeed for most of the 20th century three or more times more) popular before the gap closes again: ‘education’ is becoming less popular relative to ‘learning’. The charts show correlations so describe rather than explain patterns. Why changes in patterns occur, their causes, is not something that they can do and I tend to use them for a bit of fun. Sometimes it’s fairly banal. You can compare trends of ‘classroom’ etc with ‘building’ and ‘construction’ and see similar stalling or downturning patterns in and shortly after times of economic downturn which is hardly surprising. But some things are more interesting – in particular the relative changes of ‘education’ and ‘learning’. 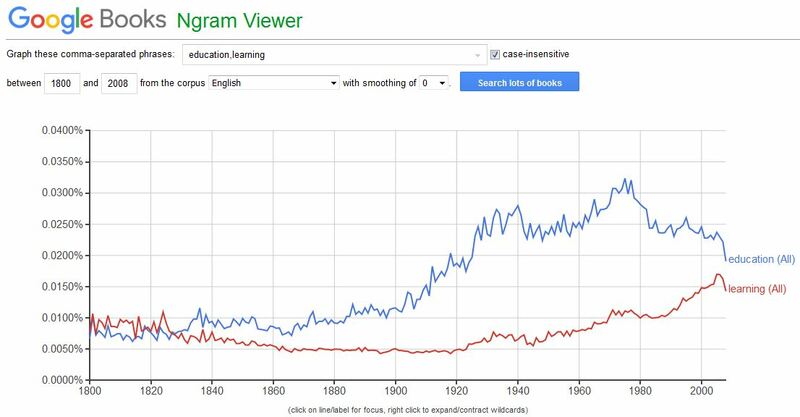 ‘Education’ was a success story during the period 1900 to 1975-ish but has shown a fairly steady decline since then in contrast to ‘learning’ which has gone from strength to strength. ‘Learning space’ and ‘learning environment’ as distinct terms have grown hugely since 1990 or so. ‘Classroom’ on the other hand has flattened or declined since the mid-90s. In my own research and teaching experience the shift from ‘classroom’ to ‘learning space/environment’ at least in England has been quite significant and I wonder if and how this might reflect and reproduce changes in how we think of education and its participants. ‘Classroom’, after all, is a noun based on the possession of a space by a social group, a class. The space is theirs, they are defined collectively, it is clear there is a ‘they’: people are at the centre of the construction. ‘Learning space/environment’ describes (optimistically, let’s face it, since it is difficult to ascertain learning, its extent, what it is of) a site’s assumed activity – a potentially individual, internalised and more psychologically-framed one. Similarly, to call a space a ‘learning space’ is not just aspirational, it is an ontological claim: this is a space where learning happens – hard to evidence and very hard to know who is learning what, in what ways. ‘Teaching space’ is more dull, less engaging, old-fashioned perhaps but it is probably more modest, more honest, more accurate and it is certainly more verifiable. It is also narrower: if everywhere is in some way a learning space, then calling a particular space a ‘learning space’ adds nothing except the performative hope that that is what it will become. Another way to approach these issues is to ask what happens if we re-name “restaurant” as “eating space”? What is gained and what lost in this more functional description? Where would you rather do your eating? Why? Is eating all that’s important in a restaurant? Transpose these questions to “classroom” and “learning space”. What is happening here? Neither ‘classroom’ nor ‘learning space/environment’ are neutral terms; they both have baggage. But every now and again it is worth asking to see inside those bags and perhaps find out what other ideas and ideologies they contain and sustain. Note: I’d love to hear from anyone with thoughts about if and how educational language is changing in other languages – I realise the above is very English-focused and uses Google’s English corpus. There are a number of corpora in other languages. * = Something I’ve not focused on here is the way that ‘learning’ has increased not simply because of its replacing education but as a result of developed interest in informal learning and social theories of learning. Then there’s the whole focus on the ‘learning society’ and learning as part of neoliberal modes of governance, schooling and the imperative to keep up-to-date skills-wise. We’re all learners and always have been but who or what does the recognising and what they recognise as Learning changes. That’s for another day.